My great memory of food experiences from Malaysia is the great culinary diversity. Even though I haven?t been to Malaysia since June 2009, I can still remember the fine taste of the Nasi dishes ?- they?re my favorite! 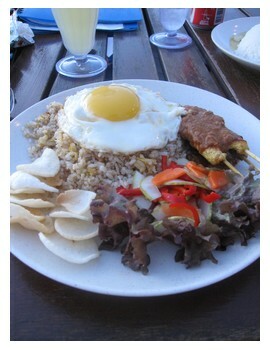 I tried the Nasi Goreng Kampong in Kota Kinabalu, and I immediately got addicted to it. Anchovy, egg, beef with ?satay? and fried rice might sound alien to some travelers. But I can promise you that this special food combination will make you crave for more! Another favorite was Mee Hon Goreng ?- a noodle dish which I recommend! Then it was the BBQ lamb from a Chinese restaurant in KK. The lamb literally melted on my tongue ?- it was tender and the taste exploded in my mouth. RM 2-5 you can get a soup right on the sidewalk in Chinatown. Heaps of travelers and locals sit on the sidewalk and eat delicious Malay-Chinese food. All the smells of spices and BBQ that penetrate your nostrils will lure you into eating! The atmosphere is contagious! Sitting on a plastic chair around a plastic table with a Malay dish in your hand, will certainly make this street food experience memorable and worthwhile. If you walk another 10 minutes, you?ll get to Little India where they have hawker stalls. Here you can grab some Roti canai and Teh Terik (traditional hot tea) for less than RM 1. As a traveler in the country, you're bound to try Malay dishes. You won?t find anything as unique as the taste of Malaysian cuisine.